The Chianti Classico region is celebrating it’s 300th anniversary this year. It’s one of the most famous wine producing regions of the world, and possibly one of the most misunderstood regions, as well. Most wine lovers have heard of and drink Chianti, they may not know the difference between a regular Chianti and a Chianti Classico. Classico refers to the original zone of production for Chianti, the heart of Chianti lying between Florence and Sienna. The region’s borders have been expanded over the years, but the Classico zone stays separated. 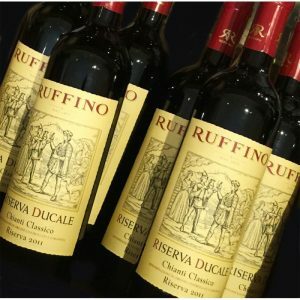 Today’s featured wine is one of my favorite Chianti Classicos, Riserva Ducale, named for the Duke of Aosta of the royal family. It’s such an amazing wine to pair with food, its balanced acid, rich tannins and wonderful dried spice characteristics make it a perfect match with pasta, of course, but well paired with grilled meat and veggies. I would even pair this wine with salmon, pork or duck. I could go on forever. Let it breath for 30 minutes or so and toast the 300th anniversary of one of the worlds greatest wine regions. Salute! !